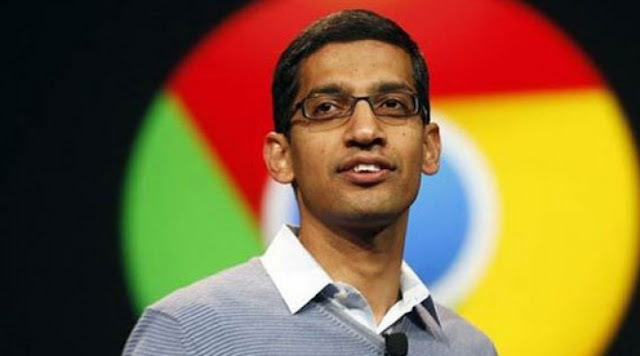 New York: India-born Sundar Pichai is the new CEO of Google under a major restructuring at the technology giant, as co-founder Larry Page lauded the IIT alumnus’ “progress and dedication” and said it is “time” for him to take over the company’s reins. Page announced the formation of a new parent company Alphabet Inc which will replace Google as the publicly-traded entity and all shares of Google will automatically convert into the same number of shares of Alphabet, with all of the same rights. Google has becomed a wholly-owned subsidiary of Alphabet, which will have Page as CEO and co-founder Sergey Brin as President. Pichai, 43, who was previously in-charge of product and engineering for Google’s Internet businesses, will be the CEO of the “slightly slimmed down” Google. He received a B.Tech. From the Indian Institute of Technology, Kharagpur and holds an M.S. In Engineering and Materials Science from Stanford University and an MBA from the Wharton School. He had joined Google in 2004 as its vice president of product management, where he led the team working on Google’s Chrome browser and operating system. In a blog post yesterday, Page lauded Pichai for his work at the company and said he feels “Very Fortunate” to have someone as “talented” as Pichai to “run the slightly slimmed down Google and this frees up time for me to continue to scale our aspirations”. “This new structure will allow us to keep tremendous focus on the extraordinary opportunities we have inside of Google. A key part of this is Sundar Pichai,” Page said. “He has really stepped up since October of last year, when he took on product and engineering responsibility for our Internet businesses. Sergey and I have been super excited about his progress and dedication to the company. And it is clear to us and our board that it is time for Sundar to be CEO of Google,” Page said. Pichai joins a gradually growing list of Indian-origin technology and business executives working their way up to head multi-billion dollar worth American giants. In February last year, Satya Nadella was named Microsoft CEO, becoming the tech giant’s only third chief executive after Steve Ballmer and Bill Gates in its 40-year history. PepsiCo’s CEO is also India-born Indra Nooyi and MasterCard is headed by Ajay Banga. Last year, New Delhi-born Rajeev Suri was made CEO of phone company Nokia. Anshu Jain was till recently the co-CEO of Deutsche Bank. It is noteworthy that Pichai’s appointment comes just over a month before Prime Minister Narendra Modi is scheduled to visit Silicon Valley in September and is excepted to meet heads of various technology giants based there. Page noted that he has been spending quite a bit of time with Pichai, helping him and the company and would continue to do that. “Google itself is also making all sorts of new products, and I know Sundar will always be focused on innovation — continuing to stretch boundaries. I know he deeply cares that we can continue to make big strides on our core mission to organise the world’s information. Recent launches like Google Photos and Google Now using machine learning are amazing progress,” he added. He said that the new name for the parent company ‘Alphabet’ is “awesome”. Pichai has had an extremely impressive track record at Google, overseeing the successful launch of the Chrome web browser in September 2008. Explaining the new structure, Page said Alphabet will be a “collection of companies”, the largest of which is Google. This “newer Google is a bit slimmed down,” Page said. “Our company is operating well today, but we think we can make it cleaner and more accountable. So we are creating a new company, called Alphabet. “We’ve long believed that over time companies tend to get comfortable doing the same thing, just making incremental changes. But in the technology industry, where revolutionary ideas drive the next big growth areas, you need to be a bit uncomfortable to stay relevant,” Page said. Page said that Google companies that are “pretty far afield” of the main internet products will be contained in Alphabet instead. He cited companies like Life Sciences (that works on the glucose-sensing contact lens), and Calico (focused on longevity) that will come under Alphabet now. “As part of that, we also said that you could expect us to make ‘smaller bets in areas that might seem very speculative or even strange when compared to our current businesses.’ From the start, we’ve always strived to do more, and to do important and meaningful things with the resources we have,” Page said. Alphabet will be about “businesses prospering through strong leaders and independence” and its model will be to have a strong CEO who runs each business. “We will rigorously handle capital allocation and work to make sure each business is executing well. We’ll also make sure we have a great CEO for each business, and we?ll determine their compensation,” Page said. With the new structure, the company will implement segment reporting for the Q4 results, where Google financials will be provided separately than those for the rest of Alphabet businesses as a whole. Under the re-organisation, Search, Advertising, Maps, YouTube and the company?s mobile operating system Android will remain under Google. The parent company Alphabet will have Google, maker of Internet-connected devices for home Nest, high-speed Internet service Fiber, investment arms like Google Ventures and Google Capital and incubator projects like Google X, which is developing self-driving cars and delivery drones. Alphabet will also include ‘X lab’, which incubates new efforts like ‘Wing’, the company’s drone delivery effort. “For Sergey and me this is a very exciting new chapter in the life of Google?the birth of Alphabet. We liked the name Alphabet because it means a collection of letters that represent language, one of humanity’s most important innovations, and is the core of how we index with Google search! “We also like that it means alpha-bet (Alpha is investment return above benchmark), which we strive for! I should add that we are not intending for this to be a big consumer brand with related products?the whole point is that Alphabet companies should have independence and develop their own brands,” Page said. He said going forward he and Brin are “excited” about getting more ambitious things done, taking the long-term view, empowering great entrepreneurs and companies to flourish, investing at the scale of the opportunities and resources, improving the transparency and oversight and making Google even better through greater focus.